The Northeast has just been hit by its first snowfall of 2015! Granted this wasn't much more than a light dusting, but it is exciting nonetheless. With winters like these, we Northeastern girls are put up to the challenge of dressing for both warmth and style. 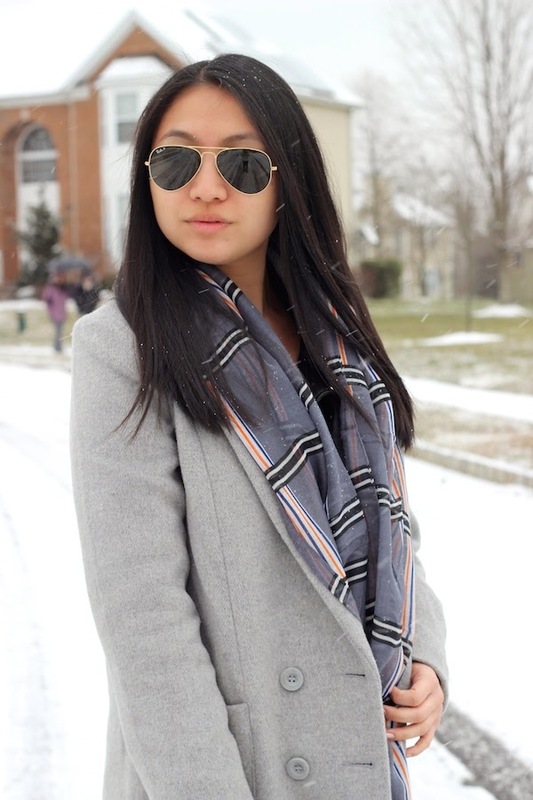 In this case, I'm taking on the snow with a new statement scarf in grey and orange windowpane. I guess you could call this an attempt to bring some color into my winter wardrobe. To play on the colors of the scarf, I paired it with a matching coat and blue distressed boyfriend jeans. I love the juxtaposition between tailored and slouchy pieces for a casual day, especially since these in particular add some lightness to an otherwise grey day. It isn't the most colorful outfit, but it's a step up from my typical black ensembles, right? I hope everyone is staying warm as we inch further into the winter! What are you wearing to battle the cold? PS. -- I'm hosting a $25 gift card giveaway with The Mint Julep Boutique here that ends tomorrow! Be sure to enter for your chance to win! you look very lovely, iIlove the jeans and the grey coat, you are very pretty! You look stunning! Kinda jealous of the winter wonderland the East Coast is having ;p It is 80 degrees over in California haha. Haha thank you Vivian! I'm jealous of the weather over there though!! OBSESSED with those booties... and the snowy photos! !